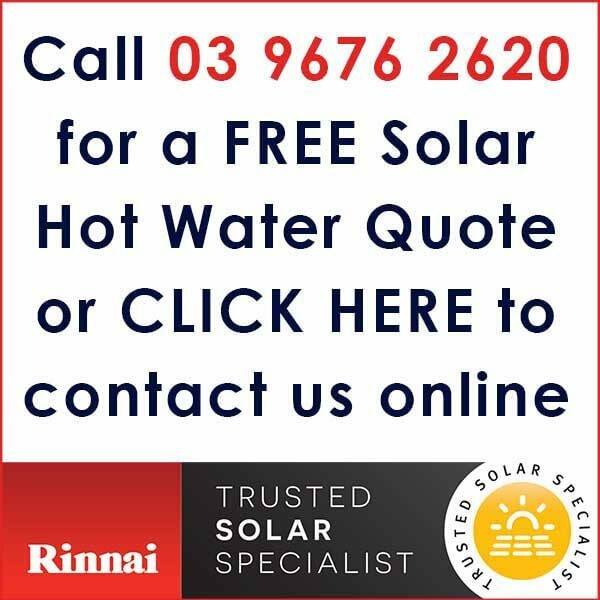 Living Solar is a Melbourne based distributor of Rinnai Solar hot water systems. Living Solar specialises in Rinnai Solar hot water systems, as these are amongst the most efficient and cost effective systems available today. Rinnai Solar hot water systems will not only reduce your carbon footprint by up to three tonnes per annum, they will also reduce your running costs by as much as $826.00 per year. Each solar hot water system installation is tailored to suit the needs of each individual customer and their home. Whether it be a one bedroom holiday shack, or a seven bedroom mansion, Living Solar can design and specify the correct system to meet your needs. Living Solar’s hot water installers do not take a ‘one size fits all’ approach. Rather, we take the time to talk to you about your individual requirements and design the system based on those requirements, while taking into account your home’s unique features concerning the installation e.g. shading or orientation. Living Solar uses only fully licensed plumbers and gas fitters to install its solar hot water systems. Our installers offer the very highest service and expertise, and have had many years experience installing different brands, while specialising in Rinnai Solar hot water systems, including Rinnai Prestige or Rinnai Sunmaster solar hot water systems. Living Solar suppliers can work in conjunction with your designer to fully integrate your solar hot water system into your new home or renovation. Contact Living Solar today to find out more about how switching to solar hot water panels could benefit your family.